Ahh, it’s summertime and party time! These days seem to be a whirlwind of showers, graduations, weddings, birthdays, recitals – lots of celebrations that include feeding people. 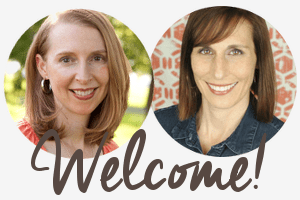 I don’t know about you but I never seem to have many “go-to” appetizers but then this recipe challenge came to the rescue. 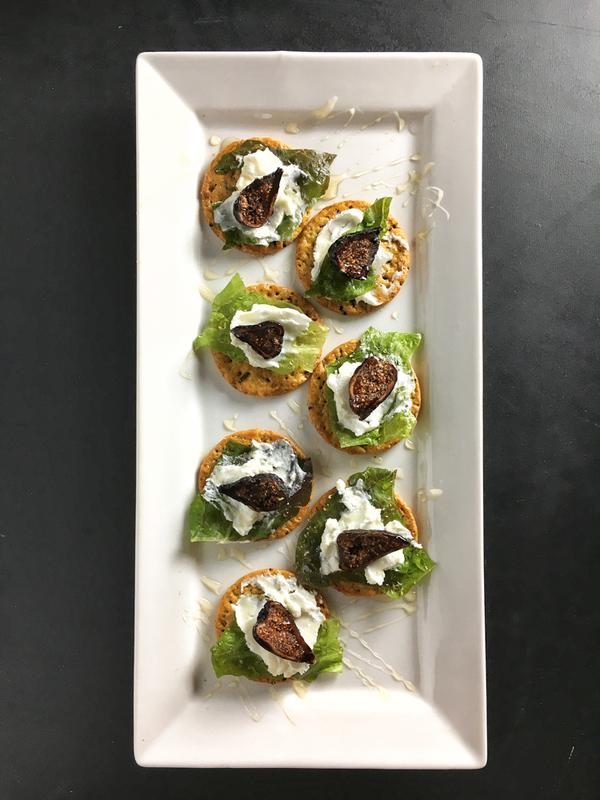 Breton Crackers is sponsoring this month’s Recipe ReDux contest and challenging our bloggers to create simple hors d’oeuvre recipes using 5 ingredients or less. So, I got try their new Artisanal Sweet Potato and Ancient Grains crackers, which not only are light and crispy but wow on the taste! They’re made with wheat, quinoa and rye and have pieces of sweet potato baked into each cracker – they’re pretty darn delicious on their own and are a great base for both savory and sweet bites. 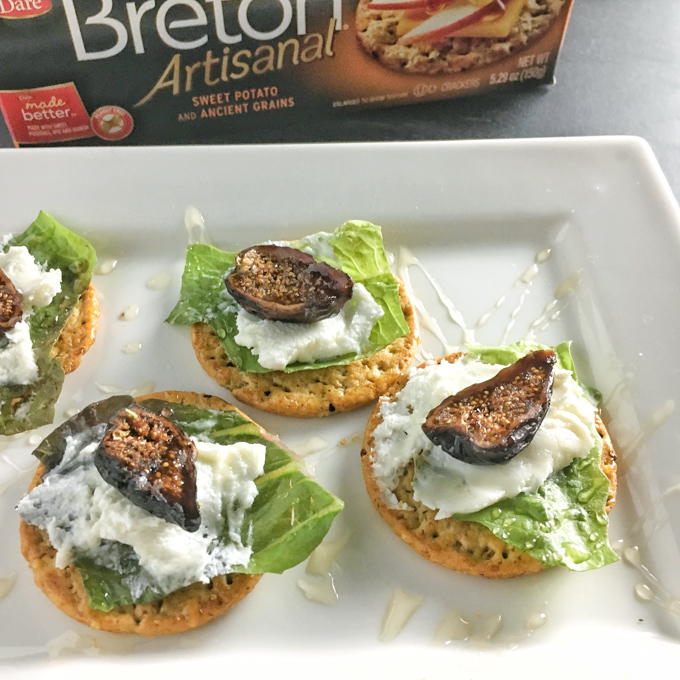 Easy-to-make appetizer: mini fig and goat cheese salads on top of Breton crackers. To assemble, place a piece of lettuce on each cracker. Gently spread goat cheese over each piece of lettuce. Top with a fig half and place all crackers on serving tray. Drizzle with honey. Sprinkle with black pepper if desired. Serve immediately. If you are stumped for what to serve your guests at your next gathering, check out all the ReDuxers’ appetizer recipes below using Breton crackers. What a delicious looking appetizer and fancy enough or a wedding or nice dinner party! I never have many “go to” appetizer recipes either but I’ll definitely be adding this one to my list, plus those crackers are just so good! These look great, Deanna. 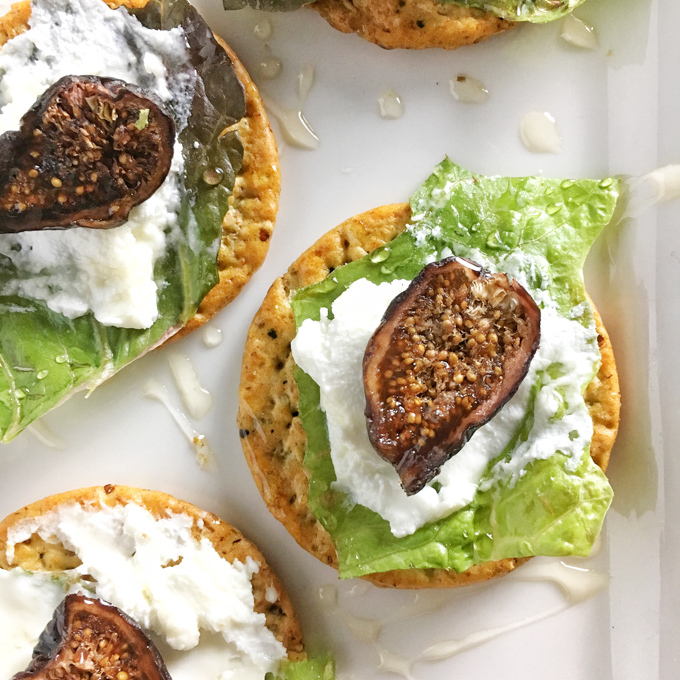 Fig and goat cheese are such a great combo but substituting dried figs make these a year-round option! Wow, those looks totally amazing. I’ll be honest – I can’t wait to prepare them! I have never ate anything like that, so I’m very curious.